Last Tuesday, my nephew celebrated his 1st birthday. My mom and I had not seen my sister, brother-in-law, and nephew in a month since their move to Shreveport, LA. We decided to drive there on his birthday to celebrate and spend the week. I decided before I left home that I would make John Michael a healthy smash cake. If you haven't heard of a smash cake, it is the cake specially made for the birthday boy/girl and he or she usually smashes into it. haha! I prepared the topping at my sister's house which was simply whipping cream I beat until soft peaks then whisked in some vanilla yogurt. I piped the "icing" onto his cake by cutting a slit into the corner of a zip top bag. John Michael didn't quite know what to think of the cake so his daddy gave him a little taste of the "icing" and it was all over from there. Needless to say he loved it! On Saturday we had a birthday party for John Michael with my dad and younger sister and my brother-in-law's family. Again, I wanted to make John Michael a smash cake. My sister asked my mom to make the big cake which was a monkey cake to go along with the monkey theme of the party. 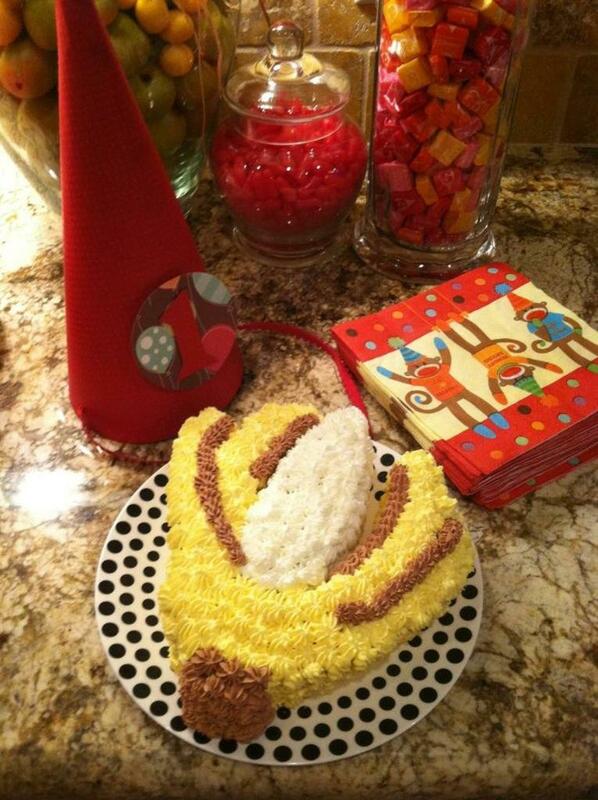 I decided to make our little monkey a banana flavored but also shaped cake. 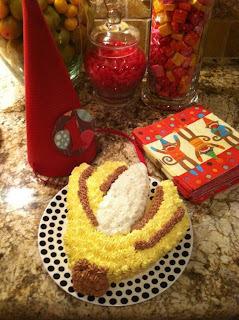 For this cake, I baked a round cake and cut it into a peeled banana. For the "icing," I wanted it to hold better than just whipped cream so I beat whipping cream until soft peaks and added some Dream Whip as a stabilizer and a little powdered sugar for sweetness. I colored some of the "icing" yellow and some brown. It was so simple and easy to make and decorate his cake. The monkey cake my mom made turned out so cute and most importantly it tasted good too. My crafty older sister made these jars to hold peanut candy (monkey food), m&ms (monkey poop), and twizzlers (monkey vines). She simply wrapped ribbon around each jar and placed a cut out circle from wrapping paper on top of it. She then taped on the felt monkey head that she bought from a craft store. The whole expense of the craft project probably cost $12 which includes the price of the jars which came from Fred's dollar store.